Kansas City is a crossroads sandwiched between the South, the East, and the Midwest, a city split in half with one side in Missouri and the other in Kansas. This is a recipe for an identity crisis. Even its deservedly famous barbecue can’t quite make up its mind what it wants to be. Like Texas, Kansas City loves brisket, but Carolina-style pulled pork and pork ribs are just as common. And the South’s sweet tooth shows up in their barbecue sauce which can be a thick, molasses-infused confection. But almost all barbecue restaurants also offer a thin, peppery sauce that is a cousin of Eastern North Carolina’s vinegar-based sauce. It’s no wonder they cling to burnt ends, which many non-KC pitmasters discard or toss in their beans, as the heart and soul of KC “Q”. So what is the secret to growing vinifera in Missouri? As they say in real estate, location, location, location. Mike Amigoni thinks the key to his site is the black and white limestone that sits about a foot under his topsoil. He speculates that the hard limestone promotes lateral development of the roots promoting better water distribution. Whatever the explanation is, the battle in each vintage is always with disease pressure. Although Missouri gets hot enough in the summer to ripen vinifera, the inconsistent distribution of heat and the wet climate make every vintage a dicey proposition. Producing disease free fruit requires the constant monitoring of vineyards for the first signs of rot, and if sour rot hits his Chardonnay there is not much he can do. “There is no spray that will knock it out”, Mike laments. Winter kill is another threat. In severe cold he builds hills of dirt around the trunk of his vines but the first buds will be ruined even if the plant is saved. That is a lot of work, worthwhile if you love vinifera and want a European-style wine, but probably too much effort and heartbreak for everyone. Given all these challenges, most of the wineries in the region are sticking to the non-vinifera varieties. 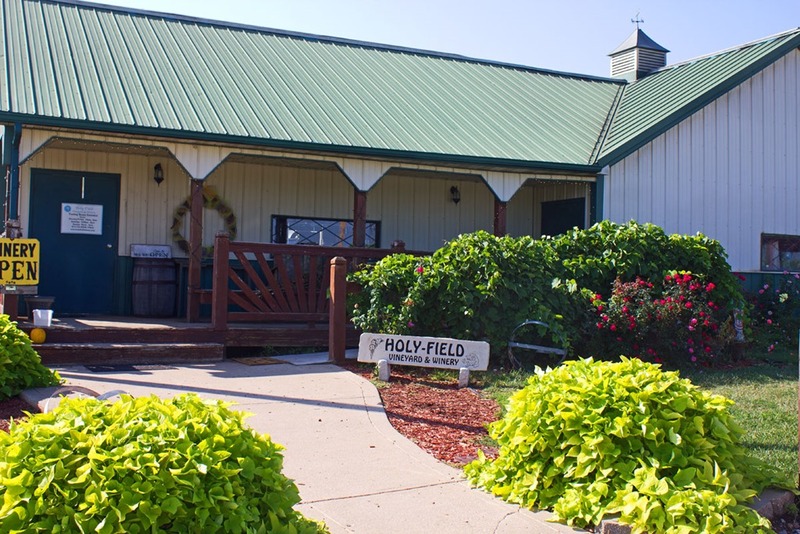 Michelle Meyers, co-owner of Holy-Field winery, the oldest winery in Kansas still in operation, said she tried growing vinifera years ago but gave up. “They just are not cold hardy enough” especially because, unlike Missouri vineyards, most Kansas vineyards lack proximity to a river that would help moderate the effects of winter cold and spring frost and provide hillsides formed by the river valley to help with drainage. As Michelle notes, most grape farmers in Kansas didn’t buy land for its vineyard potential. “Whatever success they had just came from Midwestern ingenuity.” The challenges on the Kansas side are similar to those in Missouri. But the industry is less developed in Kansas in part because the local population was less sophisticated about wine in comparison to Missouri residents, especially those in the East near St. Louis where winemaking has long been established. When she first started in the mid-1980’s, Michelle’s mother who manned the tasting room would get calls from people asking what people did at a winery. Run-ins with the Women’s Christian Temperance Union were also a feature of the winemaking life in Kansas in the early days. As to the decision to plant vinifera, the solution to an identity crises is to let a thousand flowers bloom, embodying Walt Whitman’s paean to diversity: “Very well, then I contradict myself, I am large, I contain multitudes.” Kansas City vintners don’t have to choose between vinifera and non-vinifera. The can do both. Their position as a crossroads makes this a fascinating wine region, an embodiment of the rich diversity of American wines. On the white wine side, matters are bit clearer if only because some of the hybrid grapes make really satisfying wines. Although Chardonel remains controversial because it is often hard to grow and lacks the depth of its parent Chardonnay, Vignoles and Traminette make beautiful, aromatic wines albeit usually in a sweeter style. Vignoles shares many characteristics with Riesling and the spicy Traminette can be a dead ringer for Gewurztraminer. Seyval Blanc and Vidal Blanc are versatile varieties covering the light, fruity spectrum and are sometimes made in a dry style. The new star on the horizon is Valvin Muscat, a relatively new hybrid varietal that combines the Muscat family’s stunning aromatics with moderate disease and cold resistance. Several winemakers expressed great enthusiasm for this newcomer. Truth be told the Midwest still needs a white wine that can excel as a dry white with the potential to develop complexity. But with a local population preferring some sugar with their acid I detected little urgency on this issue. The wine industry here is growing, not in leaps and bounds, but steadily as befits a region where vintage variation can seriously impact the availability of fruit. It’s a 2 hour drive from Kansas City but this is one of Missouri’s iconic brands. They’ve been open since 1985 and are now #2 in volume in the state producing around 60,000 cases annually. 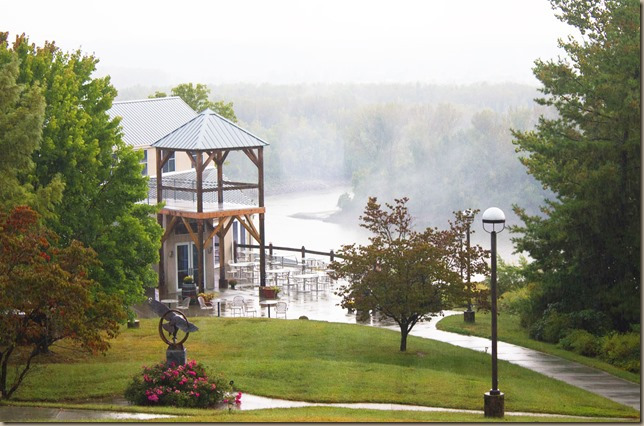 The views of the Missouri River from their Bistro are gorgeous and a fitting backdrop for their wines. The crisp Solay, a blend of Chardonel and Vidal Blanc, is a lovely everyday white and the Norton rosé ideal if you like rosé with some texture and substance. A very Gewurz-like Traminette and a luscious, semi-sweet Vignoles rounded out this impressive white wine list. And if you think good sparkling wine cannot be made with non-vinifera grapes, think again. Their Brut, made from 100% Missouri Vidal Blanc and aged on the lees 12-18 months was excellent. (See my full review here.) I tasted only one red, the soft, vibrant, Jeanette Rouge, a Chambourcin, Syrah, Zinfandel blend, with the vinifera grapes imported from California. A chocolaty Norton Port was exceptional as well. 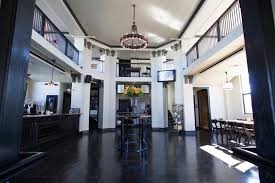 His winery located in an historic building in downtown Kansas City, Mike Amigoni is a pioneer, the first to grow substantial quantities of v. vinifera grapes for commercial use in Missouri. The tasting menu features a large selection of wines, some from Missouri grapes, some from California-grown grapes, and some a mixture depending on the yields from a particular vintage. Amigoni is unique in Kansas City in that all the wines here are from v. vinifera grapes. I found all the wines to be well-made, especially the 2014 Urban Cepages, an elegant, medium-bodied blend of Grenache and Cabernet Sauvignon that features a lovely nose of raspberry and pepper. The 2014 Urban Vaquero, made from mostly Tempranillo was well done as well, but my favorite was the 2014 Cabernet Franc made from grapes sourced from his own Missouri vineyard. It features spicy red fruits, an elegant midpalate and structured finish with very fine tannins. (See my full review here) Amigoni is living proof that fine vinifera-based wines can be made from Missouri grapes. But inconsistent yields from local fruit and his stated desire to introduce customers to less familiar varietals means that he will always be using a mix of Missouri and West Coast fruit. This winery has the distinction of pouring the best Norton I have ever tasted, a 2011 that had been lurking on the back shelf forgotten for several years. Unfortunately it wasn’t for sale but it is indicative of what Norton can be when made well and bottle aged. This is a small, family run operation with no distribution, selling their entire production out of their tasting room. It’s a destination about 1 hr. northeast of Kansas City that features farm-to-table cooking from their pizza oven each week and some excellent wines. The Vignoles was refreshing despite being semi-sweet and they feature a unique sur-lie aged Chambourcin Rose with interesting herbal aromas and great structure. A soft, pretty 2016 Chambourcin with an interesting licorice finish was a fitting introduction to their signature Norton bottlings, a robust, minty 2016 just recently released, and a lovely 2013 Norton Reserve. I’m not a big fan of Norton, but Van Till does it well. Several of their wines are double-oaked meaning they are placed in barrels, then filtered and then oaked again, sometimes in barrels and sometimes using oak chips. Michelle Meyers and her Dad Les started this winery in 1985, long before there was much of a wine industry in Kansas. They were #5, 1-4 are now gone making this the oldest winery in Kansas. All that experience goes into some charming wines. A crisp, minerally Seyval Blanc, a beautifully aromatic Traminette and the plump, generous Valvin Muscat (see my full review here) , set the tone for her delicious Late Harvest Vignoles. The reds included a spicy, lush Chambourcin, a stalwart Norton, a flavorful, sweet red blend called Tailgate (best used for, well, tailgating) and a stunning Port made from Norton and Marachal Foch and aged in neutral barrels for 5 years. Norton makes a very serious port and this one, which is in between a ruby and tawny, may be the best I tasted in Kansas/Missouri. Listening to Michelle regale you with stories about the old days in Kansas winemaking is worth the short drive from Kansas City. A small farmhouse winery with very consistent, well-made wines. The Seyval Blanc, Vignoles, Vidal Blanc and Vignole/ Traminette blend called Aromé all had a touch of sweetness but were finely balanced and full of flavor. For their reds, they make St. Vincent, a French/American hybrid that is not often seen as a stand alone varietal. This one had simple but charming red raspberry notes and subtle nutty aromas on a medium frame with robust acidity. Their award winning Chambourcins are show stoppers. Their 2014 Estate Chambourcin was earthy with a pleasing mineral seam but the award-winning Veritas from Chambourcin grapes harvested from a Missouri vineyard was outstanding. (See my review here) Campfire Red, a robust Norton, was also quite good. Amigoni is not the only winery in the region growing vinifera varietals. Somerset Ridge grows Cabernet Sauvignon, Cabernet Franc, and the first Riesling grown in the region as well as several non-vinifera varietals. Their Chardonel was among the best of this variety I tasted with great intensity and a long crisp finish. The Riesling is made in an off-dry style with 1% residual sugar and features floral and peach aromas on a medium plus body. 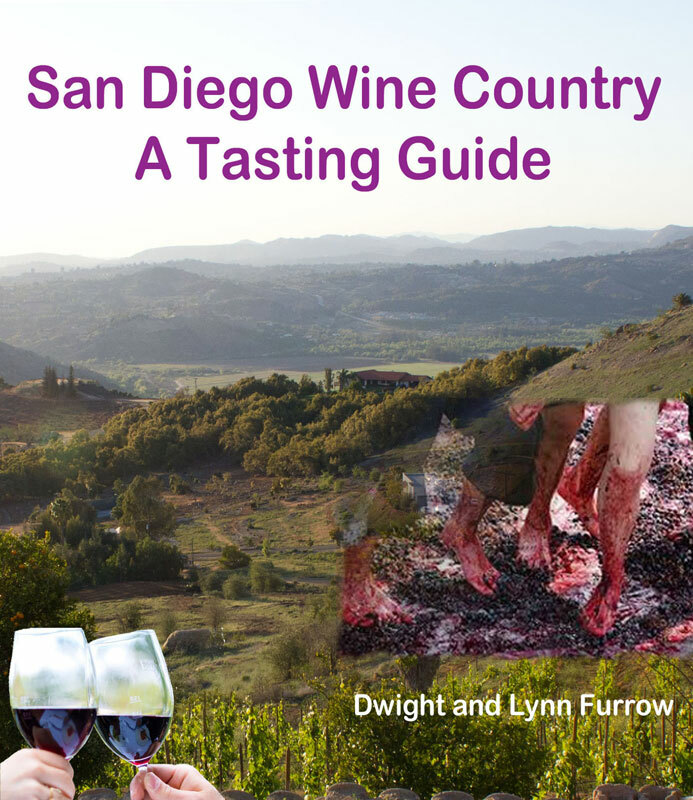 Cabernet Franc figures in several of their wines, appearing in a crisp, dry, nicely-structured rose, and also appears along with Marquette in their easy-drinking Flyboy. Cabernet Sauvignon, Cabernet Franc and Chambourcin make up the Ruby Red, another everyday wine with pleasing aromatics, a soft midpalate and a persistent finish with some grain. But the most interesting wine here is a new varietal called Crimson Cabernet. A cross of Norton and Cabernet Sauvignon, combining some of Norton’s ability to survive cold weather and resist disease with Cabernet’s flavor, Somerset Ridge was one of the first wineries to produce wine from this grape. It features dark plum and spice notes on a full body with persistent yet soft tannins. The wine is a bit edgy but intriguing and as winemakers and viticulturalists gain more experience with it, it may become an important component of tasting menus in the Midwest. For wine geeks TerraVox (aka Vox Vineyards) is the most interesting of the Kansas City wineries. TerraVox is committed to cultivating American Heritage varietals, native North American species genetically related to varietals that were first discovered and studied by the famous grape breeder T.V Munson in the late 19th Century. Most of these grapes have never been planted commercially or have fallen into obscurity. Jerry Eisterhold founded TerraVox in 1996 and set out to discover which of these varietals can be grown in Missouri soils. They also produce Norton and Traminette. Albania is a dry wine showing floral and mint notes, very crisp with lots of minerality. Unlike most wineries here, TerraVox makes a dry Traminette which was quite lean but very aromatic with floral and pepper notes. The Heritage Red is primarily made from the Carmen grape. This had a beautiful nose showing some unusual tropical notes for a red wine. Very dry and lean on the palate with soft, reticent tannins. And finally, Lomanto is a red grape with blackberry and prominent spice notes, tart, with robust, medium-grain tannins. For unusual flavors and new discoveries it’s hard to imagine a more intriguing place that TerraVox whose tasting room occupies a corner of creamery in Weston, Kansas. Cross posted on Edible Arts on 10/25/2017.